The Villas at Disney’s Wilderness Lodge Annex is a five-story vacation ownership resort consisting of studio, one and two bedroom vacation villas on a four-acre site next to the Wilderness Lodge. 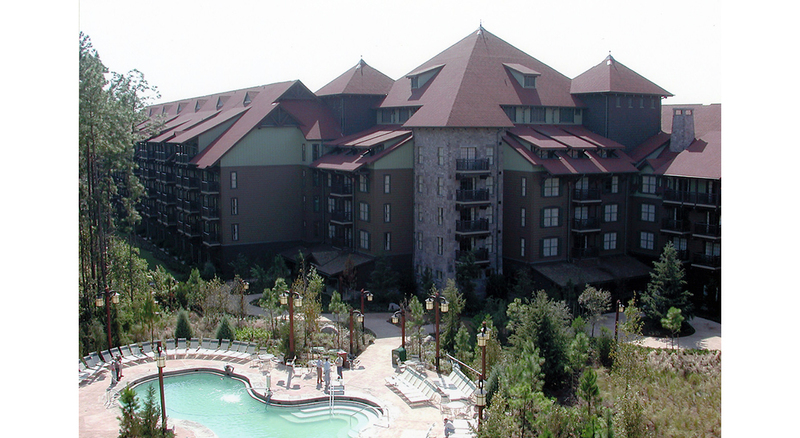 The project includes the addition of a pool and health club facility at the adjacent Wilderness Lodge. A direct walkway from the Vacation Club pool area allows guests to view “Firerock” geyser, and have complete access to both resorts. The Annex was designed in the style of the National Park Service architecture, giving its guests the feeling of the old west. While the project was not proposed to be of “log” construction, the exterior materials compliment the larger, existing structure. Creative applications of hardie board, accented with cedar shingle siding, cedar trim, and FRP log details make up the exterior of wall treatment. A decorative shingle roof gives identity to the new building, and is a pleasant contrast to the green metal roof of the existing Lodge. A taste of “Yellowstone” in the landscaping will accent the natural shapes in the pool and whirlpool spa, along with some rockscaping. This renovation will increase the existing retail space by more than 6,000 sf and the Lodge Annex by 205,000 sf. Areas to be expanded include the retail shops, the arcade and game room, and the Guest Services Counter.